The City of Thompson Recreation, Parks and Culture Department welcomes you! 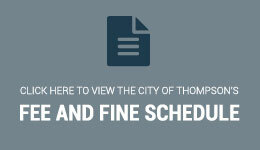 The City of Thompson provides recreational and culture opportunities to the citizens and visitors of Thompson through recreational programming, events and management of city owned facilities such as the Norplex pool and the Thompson Regional Community Center. This department is also responsible for the care and maintenance of the Thompson Cemetery, Millennium Trail, outdoor recreational areas, sports fields and green spaces. Please contact us if you are interested in learning more about our recreation opportunities.